The 14th presentation of Glasstech Asia 2016 is staged for the second time in Ho Chi Minh City from 24 to 26 November. 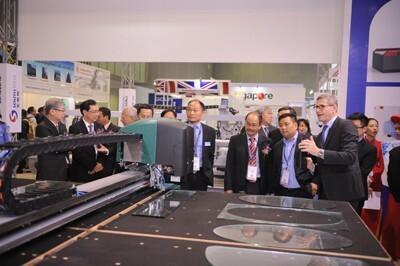 Glasstech Asia 2016 and Fenestration Asia 2016 occupies a gross exhibition area of almost 5,000 square metres here at the Saigon Exhibition & Convention Centre, playing host to 163 exhibitors from 14 countries, featuring six international pavilions from China, Germany, Singapore, Taiwan, United Kingdom and Vietnam. Demand for flat glass in the Asia-Pacific region is expected to see the fastest gains through 2018, benefiting the five of the fastest-growing national markets for flat glass worldwide, including China, India, Indonesia, Thailand and of course, Vietnam. Beside, Vietnam is also well-poised to lead the regional real estate market over the next few years, with attention focused on infrastructure development throughout the country. The property developers in Vietnam are much more experienced, financially capable and are aware of the consumer’s needs and wants which is reflected in the increased focus on design, quality and facilities provided. Accordingly, glass is fast becoming a popular material in the central treadmill of works. As such, the return of Glasstech Asia to Vietnam is a timely one indeed. Glasstech Asia 2016, incorporating Hollow Glass Asia 2016, is the preferred sourcing platform for architectural and glass processing needs – the premier showcase for the up and downstream of the glass industry, and notably one of the largest glass exhibitions in Southeast Asia. The ensured quality and standards of our exhibitors would therefore ensure the quality of the glass products and related services and technologies entering the Vietnam market. In view of the increasing demand for windows, doors, façades, related services and accessories that follows in the wake of the recent infrastructure growth, the inaugural Fenestration Asia 2016, the 1st international windows, doors, skylights, curtain walls & façade technology exhibition, to showcase industry standards in sustainability, automation, comfort and energy-efficiency.